Most definitely used the YakTrax tonight! 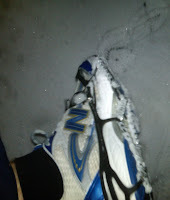 What a run, most everywhere I stepped the snow was over my ankles (unless someone just shoveled or I braved the road). Running down the road in a snow storm is not a very bright option, so treading snow it was. What a workout, it's as tough as mountain running. I felt as if I was really truckin' along, but as it turns out I was only running mid 8 minute miles. Map This site does not support embedded trip maps. View the trip here instead. Should've Worn Ice Skates: What a Crazy Run!